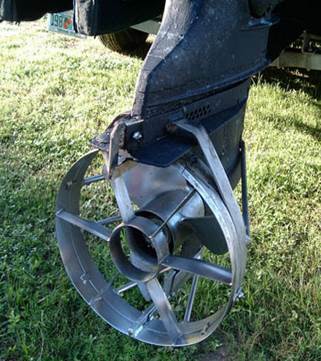 PROPELLER GUARDS keep people and animals in the water from being gashed by propellers. While propeller guards have trade-offs, and boats can still hit cetaceans, propeller guards are a safety item which can help performance: "concentric ring vanes (looks like a bullseye target from the rear)... are said to improve handling at slower speeds, increase thrust, and slightly increase top speeds in some situations." Simple guards are widely sold for $130-$150. Jet boats use a water pump in the hull, with no propeller below water, reducing dangers of cutting large animals, and reducing noise underwater. Dangers remain for animals smaller than the water intake; they can be sucked through the pump. ENGINE NOISE varies, based on engine size, propeller design, gears, whether exhaust (and noise) are discharged in air or, more often, underwater. Underwater sound intensity is compared to a change in sound pressure of 1 micro Pascal (1 µPa) at a distance of 1 meter from the source. In air, a higher standard reference sound pressure of 20 micro Pascals is used. The result is that any specific sound energy is reported with a number 26 dB higher underwater than the number which would be reported in air. "Propeller noise from a fast power boat with a 160 dB source level will be heard as a 135 dB noise at a distance of about 20 metres from the boat, but will still be at ~70 dB 14 km from the boat – enough to mask other whales calls and interfere with the ability of whales to locate prey. If multiple vessels are present their noise will add to a louder noise, although this addition is complex: two vessels producing 140 dB sounds side by side will appear to produce 146 dB noise together." 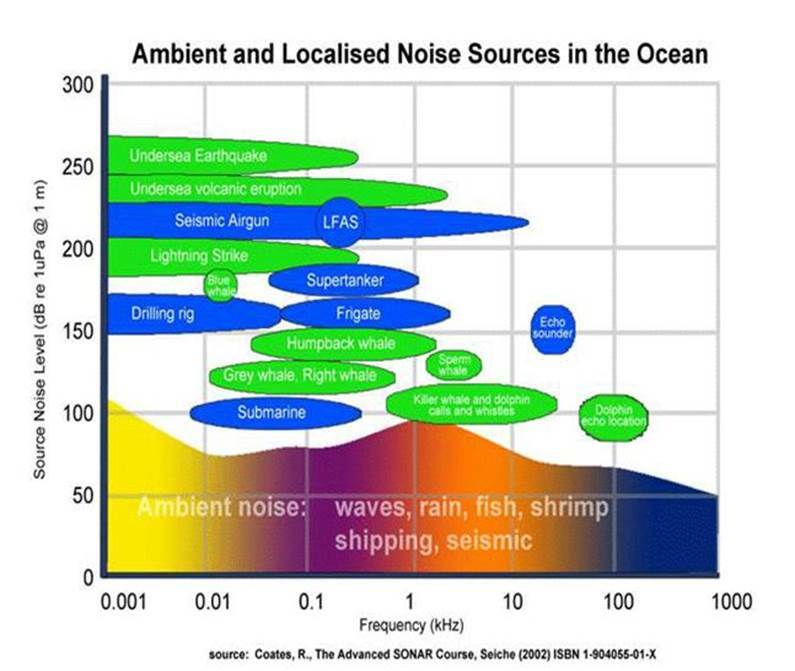 Aquo.eu has broad research on underwater noise. discounts on harbor fees to quiet ships, based on "three quiet-vessel ship classifications and three propeller technologies shown to reduce underwater noise." A 100 HP outboard motor with exhaust underwater was louder underwater than a larger boat with diesel inboard engines. The diesel boats did not put exhaust below water. Jet boats use a water pump in the hull, with no propeller below water, and had less noise underwater than other boats tested. "Typically, our idle speed test numbers fall in the 60s [dBA, on non-electric boats], the same level as a casual conversation. As the boat climbs on plane, the engine noise revs up into the 70s. Then it climbs into the 80s at cruising speeds and into the 90s as it nears wide-open throttle; some noisy boats hit the 100s." A consultant for an oyster company measured boat noises in air, in 2011, in California (p.36). A widely-quoted 1995 study submitted to the New Jersey state police by the testing company Noise Unlimited, compared noise in air from several boats, apparently in 1995. The Personal Watercraft Industry Association says personal watercraft became 70% quieter after 1998, and presumably some other engines are also quieter. * A-Scale Sound level (dBA) measurements at a distance of 50 feet. A-Scale approximates the sensitivity of the human ear and is used to note the intensity or annoyance level of sounds. Data from NUI Report No. 8077.1, New Jersey State Police-Marine Division. Nov. 1, 1995. Proposal for Quiet Zones, where there are many marine mammals and few noises. Overall Effect of Boats in Orca Habitat. 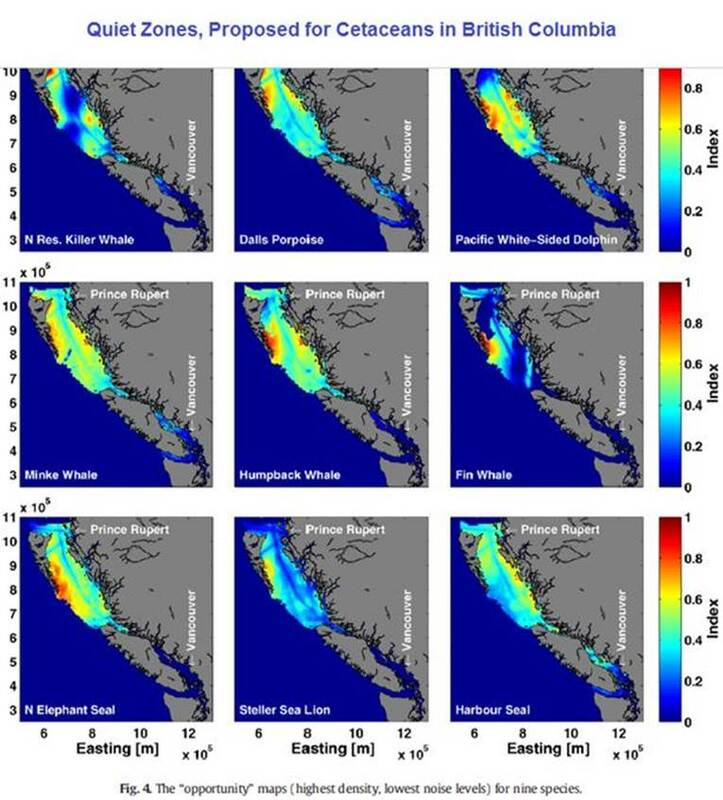 US study (Veirs and Veirs 2007) measured sound in Orca habitat off Washington state from April 2004 to November 2005. The quietest noise level (average for 30 minutes, 100-1,500 hz) was 95 dB, relative to 1 micro-pascal of pressure. They considered this "background" noise. The loudest half hour averaged 130 dB. The difference of 35 dB means it was 56 times as loud. "Large vessels like tankers, container carriers, ocean liners, fishing vessels, and tugs (hereafter "ships") pass in the shipping channels on the order of a kilometer from the hydrophones and create broad peaks in amplitude, typically lasting 15-60 minutes and having maximum amplitude ~20 dB above ambient" sound (10 times as loud as background, bold added). "Each ship usually adds 20-25 dB [10-18 times as loud]...; some add nearly 30 dB [32 times] and a few add only 10 dB [3 times]"
"The relatively quiet periods between ships are usually less than 30 minutes, but sometimes last a few hours, particularly during the early morning hours." "boats usually add 15-20 dB. 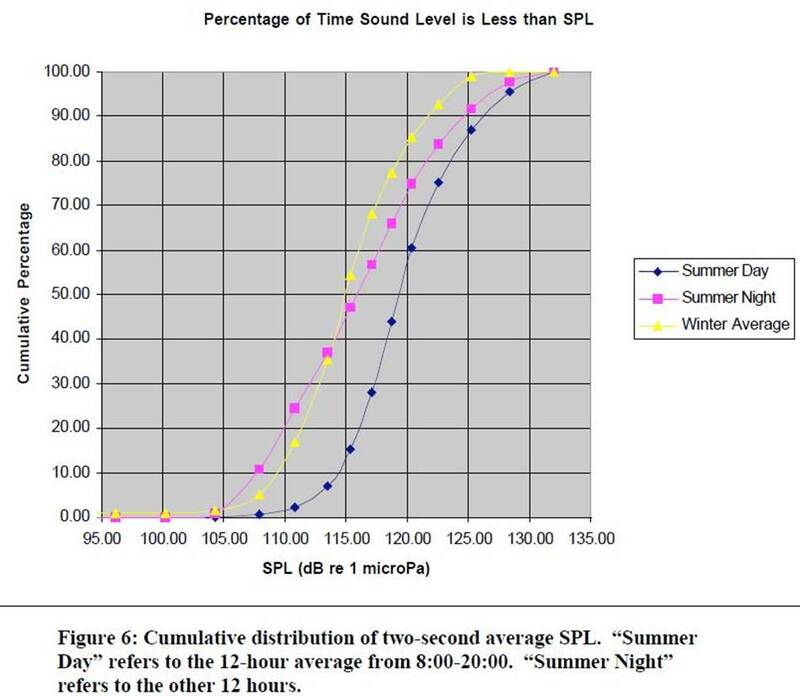 [6 to 10 times as loud as background]"
The graph of Sound Pressure Levels (SPL) shows that on summer days, noise is almost never under 110 dB [6 times background], and 60% of the time it is under 121 dB, so 40% of the summer days the sound is over 121 dB, 20 times background levels. In winter, 40% of the time sound is over 117 dB, 13 times background. A US boat builders' group summarizes the history of US noise limits and proposals in air, without considering underwater life. Erbe 2002 Noise levels of orca-watching boats. 1,000 narwhals died trapped under ice in 2008, because they did not leave their summer area before it froze over. Researchers believe the reason they did not leave was a seismic survey with air guns on their migration route. The seismic survey had "four arrays of up to 37 airguns with a combined maximum volume of 4200 inch3 and a pressure of 2000 psi."